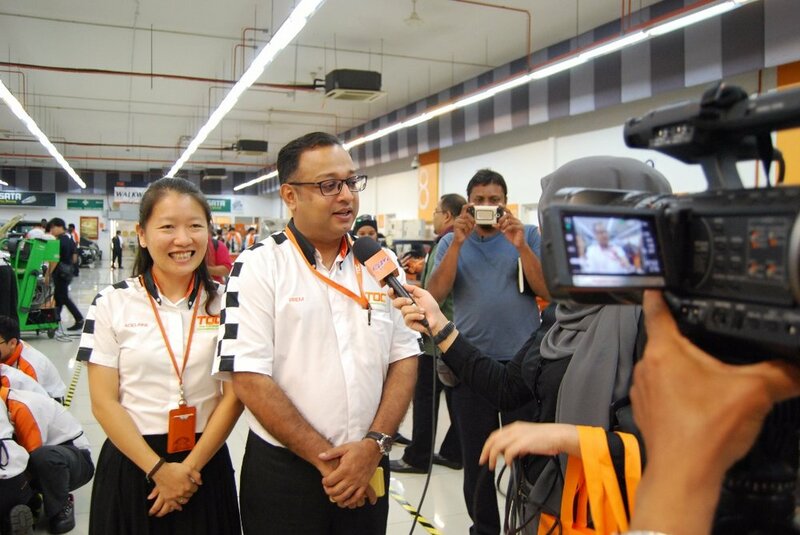 Adelaine Foo, Founder and Chief Executive Officer of TOC Automotive College and Prem Kumar Mathavan, Principle of TOC Automotive College with TOC Industry Partners at TOC Bina Bakat program launching press conference. Petaling Jaya, 22 January 2018 – TOC Automotive College (TOC) unlocks a new milestone as it introduces the TOC Bina Bakat Program, in hopes to nurture more talents and develop quality recruits for the industry. It offers both apprenticeship and loan repayment plan for students, whereby the education loan is provided for the enrolled courses and the students will only make the repayments through a monthly deduction from their salary or allowance upon obtaining apprenticeship or a permanent job placement. During the presentation of Budget 2018 last year, Prime Minister Datuk Seri Najib Abdul Razak has addressed special attention in transforming Technical and Vocational Education Training (TVET) to equip young Malaysians for Industrial Revelation 4.0. In line with this, TOC makes certain that the new program is a continuous effort to contribute back to the society by preparing young individuals with the knowledge and skills required in the industry workforce, through top-notch education coupled with an emphasis on students’ welfare. “With living costs increasing steadily, more parents and students find themselves struggling to pay for tertiary education. As the pioneering educator in Malaysia’a automotive industry, we are committed towards overcoming external challenges which could deprive higher learning opportunities among the younger generation. Through the TOC Bina Bakat Program, we hope to bridge the financial differences and provide easier access to quality education for everyone,” said Adelaine Foo, Founder of TOC Automotive College. This apprenticeship program will take up to 2.5 years for a Diploma qualification and 18 months for a Certificate course and students will alternate between theoretical learning and industrial training by selected employers (TOC’s Industry Partners) throughout the semesters. Enrolled students are required to attend rounds of interviews and undergo a psychometric test to be selected for the apprenticeship. TOC continuously strengthens its presence in the automotive and education sector in Malaysia, following through a string of strategic collaborations with industry partners over the previous year, highlighting noteworthy automotive brands such as Mistertyre Malaysia, Autobacs Seven Co. Ltd, Japan’s leading aftermarket retailer and the formation of TOC-Aylezo Racing Academy with Aylezo Competizione as well as Sepang International Circuit in the world of motorsports. The inaugural application of the TOC Bina Bakat Program is open for its first intake on 3rd February 2018. For more information, visit TOC’s official website at www.toc.edu.my or Facebook page at Facebook /TOC.edu.